Megan was 43.5" and a muscley 285 pounds in her prime. Megan was the product of an unplanned “escape breeding” on another farm. Proving that humans don't always know what’s best (particularly those who are breeding for fashion or personal whims), Megan turned out to be the llama with the most outstanding movement there! We spotted her when we visited the farm, hoping to see a paternal half-sister (from Megan’s mother) to our Greymist and also intending to assist in relocating some of the oldest llamas if possible (the owner was dying of cancer). The combination of Megan’s marked athleticism and classic coat really caught our eyes, and even though the owner and family were being VERY difficult (to say the least), we persisted and eventually Megan was ours — still unregistered and (oh, by the way) very much untrained. Megan was bright and learned quickly, although her unfortunate “upbringing” (or lack thereof) meant she was really only comfortable at home with minimal demands. More tragic, Megan's low social status (first in her birth herd and then here, as a relative newcomer) triggered another llama (no longer here) to attempt to expel her, and Megan received a permanent injury to a deep hip ligament. We were deeply disappointed that neither of Megan's offspring made the cut for breeding. Megan liked to run, familiar things, her babies, and also the security of a herd ... but not in TOO close proximity. We did our best to accommodate her. When we first saw Megan, we couldn’t figure out what llama she was and — needing some way to refer to her — we temporarily dubbed her “The Socks Llama.” When Megan’s bed-ridden owner saw the photos we sent, she also couldn’t figure out what llama that could be. The owner later found the birth notation in her herd records: the llama’s name was “Summer” because she was born at the summer solstice. 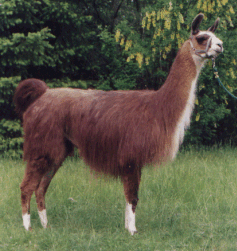 But, it turned out that when the owner’s 1997 cria crop was registered (by a relative), the name “Summer” was registered to another llama with a similar-looking mother and Megan, the llama who had actually been named Summer originally, went unregistered. This meant we had to come up with another name. We already had a cat named “Socks” and we already knew a llama named “Summer” (besides the one who ended up with Megan’s original name). With her approval, we chose “Megan”, a traditional Celtic name meaning “pearl” or “strong one” (depending on the source) and combined all her names, each relatively common on their own, into a unique and fitting name for one unique llama: Megan Summer Socks. Megan was indeed a pearl; she was strong in many ways, she was born at the summer solstice ... and she sure had a set of socks!